Goddess Kamala Devi is the tenth manifestation among Dasamahavidyas. She is depicted as with the posture of seated in red blossom lotus with four hands. As per Vedic scriptures goddess kamala devi provides more wealth in one's life by eliminating all sorts of deficiency and other budgetary issues. Kamala devi homam or puja is very helpful to achieve all prospects to lead a successful life. 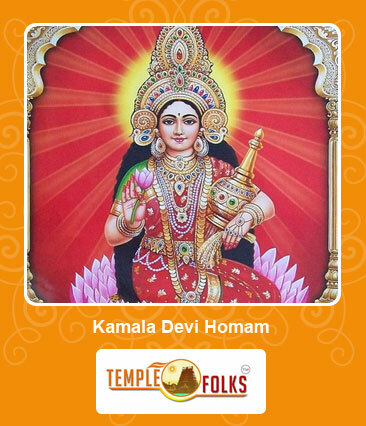 Goddess Kamala devi homam assures an individual to attain more wealth in life. Those who perform this homam are blessed with all aspects required for life like wisdom, beauty, wealth and all prosperity. The person those who perform this homam will completely relieved from poverty and provide with the grace of riches. Kamala Devi Homam is well recommended for those who facing financial difficulties in their life. Performing this homam routes a way to get all fame and profits in business. Helps in bringing peace of mind by getting complete relief from unwanted worries and problems. In addition this homam is very favourable one for women those who having fertility problem. 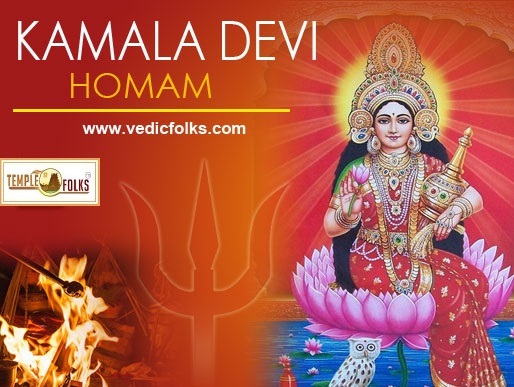 To get all the bounties and experience the enormous integrity of Kamala Devi Homam (fire customs or lab), you can get the assistance of our accomplished Vedic Purohits (intellectuals) at Vedicfolks.com on the web.